This tasting features five small-lot, estate wines. They may include our Limited Release Sauvignon Blanc, Limited Release Malbec, Family Reserve Generations Bordeaux-style blend, Vintage Selection Cabernet Sauvignon, and Cold Springs Howell Mountain Cabernet Sauvignon. Selections vary based on availability. This flight is served with small bites from our Cucina di Rosa Salumeria. Reservations strongly encouraged. We begin the tour outside (weather permitting) with a splash of Sauvignon Blanc as we view our lush Culinary Institute of America farm-to-table garden and share stories about our legendary winery. From there, we venture into our historic Redwood Cellar, where we continue with a barrel sample and finish with 3 more of our delicious Bordeaux varietals. You will also enjoy a selection of handcrafted artisan cured meats and cheeses to pair with our wines. Advanced reservations required. To make a reservation, call 707-967-2229. We serve pizza and other items at our winery and do not allow outside food. 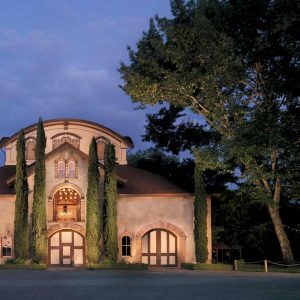 This is the oldest winery in Napa with their first vintage dating back to 1861. You can literally taste the history of Charles Krug walking up to the property. Entering its tasting room, you’ll be blown away by the interior. It’s classy design is comforting and will make you want to hang out at all day. You’ll definitely want to partake in their historic tour when you get there. This is because you get to learn all about the valley. You also get to enjoy a phenomenal barrel tasting that you won’t want to miss. Regardless, we recommend coming to this place during lunch hours. This is because they have a wonderful salumeria (aka a delicatessen) the Cucina Di Rosa. It offers amazing salamis and they even cook up woodfired pizzas every Thursday through Monday. Their outdoor patio also is a great place to relax and enjoy their wine. Charles Krug is quite unique in the fact that their long history lets them bypass many of Napa Valley’s rules. This allows them to host weddings, parties and other fun activities without having to worry about permits. This is also why the Napa Valley Film Festival is hosts screening here along with other great events. Be sure to subscribe to our newsletter to stay up to date on all the fun happenings here. When it comes to the wine you can’t go wrong. They are world-renown for their Cabs— including their flagship Vintage Select Cab which is extremely limited and has been made continually since 1943. Beyond this they are well known for their Sauv Blanc, Merlot, Malbec, and their Bordeaux blends. Overall, this winery is the perfect mix of both old and new and is highly recommended for anyone visiting Napa. I never been wine tasting before. I was looking on Groupon and this pop up! I said hmmm this would be a great annivsary present for my husband and I. I bought one for him one for me! I have to tell you this was best purchase all year! We enjoyed we where there late! It was nice Thank you for this over! Best Value for your money! It is awesome!